As a standard, the currently logged in portal user will be used. If there is not any hyparchive session for this user and the option "Username/Password" was selected as the authentication method in the configuration, then the portal user will be requested to login to dg hyparchive. There are examples of application, where access to hyparchive should always be made with one user, irrespective of which portal user is currently logged in. This is for example the case if there is not a hyparchive user for every portal user or if documents from Intrexx should fundamentally be saved under the same user name in hyparchive. To do that a so-called static user can be selected in the dialog. This relates to an Intrexx user, to whom a hyparchive user account has been assigned in the hyparchive configuration. A static user can also be directly setup with this dialog. As soon as such a user is entered in the file field, then all access to hyparchive takes place with the data group of this hyparchive user account. This means that an interactive login to hyparchive is no longer necessary in the portal. This also makes simple Single Sign-On scenarios possible without having to revert to the Kerberos authentication. 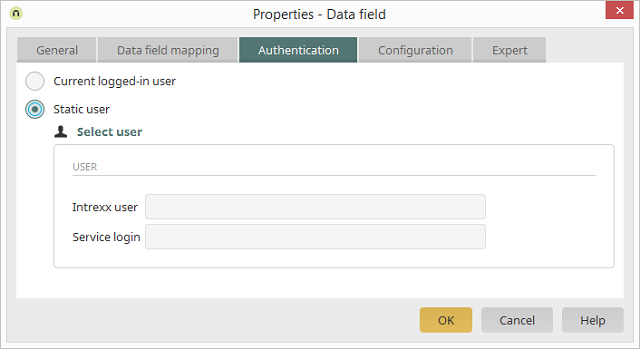 Opens a dialog where a user from the current configuration can be selected. Removes the reference to the currently entered user. After the selection, the Intrexx user is entered here automatically. After the selection, the service login is entered here automatically.